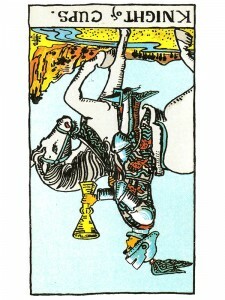 Knight of Cups (R) says look before you leap – get the whole picture. Half truths can promote difficulties in any relationship. When you allow yourself to “feel” only what is pleasurable you may be denying your “inner” self and your reality. You have mastered your desires – take advantage of your emotional energies. Be willing now to simultaneously move forward and let go – move your relationships in new directions that are emotionally enlivening as important emotional issues are resolved. You are experiencing a negative reaction to the increased demands of the world upon you. You are a passive person being pushed towards action or commitment and you do not like it. Without “outwardly” resisting – you still resent the demands being made of you. This attitude can result in a wall between yourself and the people who are making you act out your responsibilities and if you allow it to continue – it can result in manipulation, lies and tricks. You may be missing emotional opportunities. Creative block. Taking too much energy from the group or giving them too much. In the first position: Here is a curious blend of the active and passive principle, for in loving you are passively surrendering yourself to that love and yet once committed, you are active in defending your love to the end if necessary. Here both passive and active are maximized giving it the power to create legends. In the second position: If this is a person, they may not be backing you up at this time. Otherwise, you may be too involved with your objects of love and unable to move freely and quickly to meet new demands. In the fourth position: You can not get very far with the frozen concept of “idealized” love divorced from all the varied currents of life weaving through it, frequently against it – ironically, keeping it alive. In the seventh position: The emotions here may be working against the mental program, ranging from the effect an emotional problem has on the efficiency of the mind, to a lack of enthusiasm for the mind’s goals. In the eighth position: There may be a temporary block in your material affairs stemming from the emotional. Also, physical matters may have adversely affected the Emotional/creative Plane. Hi! I love your site and I visit almost everyday! Do you have a book or some materials that I could purchase?